With his big break in 1984, Colin James never looked back. In the early 90’s he helped resurrected the swing sound with his Little Big Band, and a gold record in 1998, his 6th CD, planted him firmly as a Canadian artist with staying power. Now, decades later, he looks back at a career that has him releasing 16 CDs, performing for the Queen and heading to the podium to accept more than one major blues awards. He’s now topping Blues charts south of the border and overseas and feels like he’s getting his second wind. I spoke with Colin between sound-checks on the first leg of his tour ‘Miles to Go”…. Mb: Hey Colin, how are you? Colin: I’m alright man, how are you? Colin: Ya, though we’ve done about six shows already. After waiting so long to get out there, it’s pleasing to get going and get everything working right, and slowly get the bugs worked out and making sure everyone’s rig is great. I’m just having a riot! Mb: And it’s a classic Canadian tour, from one coast to the other. Colin: Ya, and we’re hauling a Hammond organ everywhere we go. (laughs) I finally bought a Hammond organ. Colin: I never had one myself. People who played with me always had theirs, and then about 2 or 3 years went by and we didn’t rent them as often, and we were using simulators, and I finally just said “You know what? If that’s what it’s going to take, I’m buying a damn Hammond!” So I did. Mb: All part of your old-timey sound? Colin: That, and there’s not a lot of people that play the Hammond anymore. I think it’s one of those lost arts. The simulators are pretty good, they sound pretty realistic, but you can’t do the draw-bar work you can on a real Hammond, so I’m really pleased. My guy, Jesse O’Brien, gets to play it every night and that’s just awesome. Colin: I’ve told this one a lot, my god. But it still doesn’t change the fact that it was one of those moments in your life, and we all have them, where you have a choice to do one thing or the other. My choice that night was… I just happened to be in Regina. I wasn’t living in Regina, I was living in Vancouver. I had come back, just for the weekend out of frustration, cause I was having a hard time getting steady work in Vancouver and making a living. I think I was a bit broke and I went back home to stay with my Mom for a couple of days, and I got a call from a promoter about three in the afternoon. He says, “Colin, it’s your old friend the promoter who got you on those George Thorogood gigs, can you be in Saskatoon tomorrow or tonight by six?” And I went “I just got home, and I don’t know if I have anyone I know here.” So I took a leap of faith. I couldn’t find anyone in Regina so I phoned the Saskatoon Jazz Society and I said “Hey, is there a drummer and bass player that can meet me at the Jubilee Auditorium at 5 o’clock?” And they said “Yes” and that was the end of it. I met with these two guys I’d never met before, had a little rehearsal… Steve came busting into the room laughing and said “Is it true that you guys just met each other?” I said “Ya, I’m sorry but, yes!” (laughs) He had a big laugh and split, and then got me on stage with him later in the night and the next night again. At that point he offered me to go to the States with him, but I had a job with a band in Vancouver and I phoned the leader of the band and said “Hey, Stevie has offered me to go play Buffalo and a bunch of other cities, would you consider joining me? I don’t care if we call it your name and your band, doesn’t have to be my band.” And my boss said, “No! Get back to Vancouver or you lose your job.” I had just moved to Vancouver, and I wasn’t going to lose my job so I didn’t go with Stevie, I went back home to my job. Isn’t that ridiculous? The next year, he came back again to Alberta and actually asked for me and I opened up the Calgary and Edmonton shows. That was about a year later. That’s it. And then he bought me a ticket to the States, a plane ticket, and the border wouldn’t let me over the border cause I was too young and I didn’t have a credit card. I only had cash ‘cause I’d sold some stuff to get down there. I actually had to phone Stevie’s accountant Edie and say “You’re not going to believe this but, I wasn’t let over the border and the plane ticket went to waste, I’m so sorry. Is there any way you could do another one?” And they did! They bought me another ticket… to Austin. So It’s just unbelievable, right? Colin: Ya, and then I start getting calls from managers and started criss-crossing the country and put the work in. Those early days of work were like… that’s back when you’d play a club for a week at a time. That doesn’t happen anymore. It was cool because, you could come in on a Monday and have nobody, but by Wednesday start getting the word of mouth out there, and by the weekend have the place jumping. You’re not allowed that anymore. You’ve got two days or a day, and that’s it. Colin: Exactly and it was pre-dj days so there wasn’t an alternative to pay one guy way less money. (laughs) I think about street musicians now, how hard that is because nobody carries cash! Mb: The latest album, Miles to Go, I’m assuming that you have a lot of road left in you? What about other stuff in your life? Hobbies? Philanthropy? Colin: Really, the music is first and foremost for me. It’s what I’ve always done and I find this late in life I’m starting to have a bit of a reawakening internationally, as far as Europe and the States is concerned. You know, it just goes to show you that, you’ve got to keep going. It’s easy to get discouraged. All of us have those moments when you go, “Oh man. I’ve fallen in a rut.” But if you can see through those times, there’s really a pay-off and who would have thought that in my 50’s I’d start getting on Blues charts that I didn’t get on all my whole life. Why now? Who knows why? It’s just the way it goes and a bunch of mitigating factors, but it just goes to show you, keep your head down and keep going. I find that when you do this for a living as long, when you don’t play for awhile you start really questioning your existence. (laughs) Who am I? What do I do? You know? If I go four months off without playing, it’s kinda shocking. I don’t like it. Mb: So you must like the road. You have a lot of records, you must loved the studio too? Colin: I’m not a practicer. I’ve got to have a reason. I don’t mind writing songs and practicing them, but I won’t just pick up a guitar and do scales, you know? I have to be out there doing it! Mb: And soon you’ll be “doing it” in Peterborough again. You’ve always done well here. Colin: Ya, and it’s such a big population around there too. We play Showplace there and always look forward to that. We’ll have quite a few shows under our belt by then. 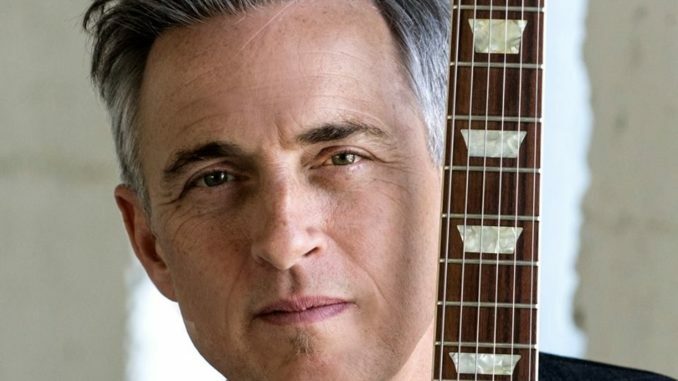 Colin James will be appearing at Showplace Tuesday April 9, 8pm.